Your wings exist. It is time to open them and dare to jump even though you do not know where you will land. This workshop will empower you to believe in your body and explore space in all directions, including upsidedown. This day is all about you. It is about you exploring space within you as well as outside your body. You will feel connection to earth, space and your breath. 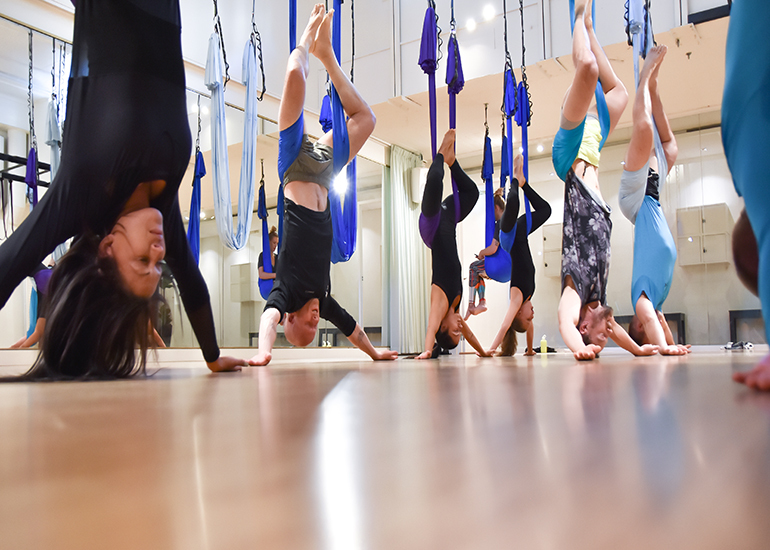 Requirements: Frequent flyer – have experienced our AntiGravity® Fundamentals classes on a regular basis. If you would like to know more about AntiGravity Suspension Fitness, please check this out. If you would like to know more about AntiGravity Aerial Yoga, please check this out. ”Open your wings and fly!” Isabella is passionate about 3 things in life: AntiGravity®, meeting people and to dance. She loves to share her passion and energy. Since 2005 she inspires her participats to dare to jump without knowing where they will land. She believes that we all will be happier through listening within and follow our heart’s path. When she is not training new instructors in AntiGravity or teaching classes in AntiGravity®, Isabella is working within her company Wings by Bella. With her daily work in project management and as group fitness instructor / yoga teacher she is reaching new hights together with the people surrounding her. All this for 850 SEK inkl. snacks and tea. Most welcome to fly with us!